Ordered by the The British Dredging Co., London, England on 27 January 1904, yard number 110, hull built by Fa. 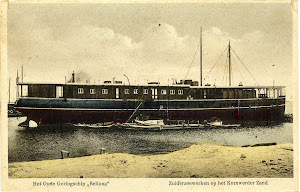 Rykee, laid down on 17 May 1904, launched on 28 July 1904, arrived at the shipyard of the Kon. Mij. De Schelde, Vlissingen, Netherlands on 30 July 1904, trial while berthed on 15 October 1904, official trial on 4 November 1904, departed towards Manchester, England on 17 November 1904, later property of the town Bristol, sold to Denmark in 1923, renamed Ægir, sunk in 1945, salvaged, sold to be broken up in 1973 which was completed by October 1982. Sister ship of the Dredger. Gross tonnage 614,57 tons, net tonnage 261,09 tons, displacement 445 (launching included 50 ton water)-1.300 (with draught 12’6”), deadweight 740 tons and as dimensions 50,00 (between perpendiculars)-51,82 (over all) x 9,20 x 4,70 x 3,81 metres or 164.0-170.0 x 30.2 x 15.5 x 12.6 feet. Draught at launching 4.5 (fore)- 4.11 (aft) feet. Speed 7 knots.